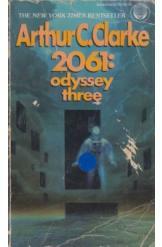 2061: Odyssey Three by Arthur C Clarke, Sci Fi. Book is in good condition, all pages intact. Decades after the previous Monolith expeditions, Heywood Floyd sets out again to solve the mystery of the Monoliths once and for all. Finding the answer will involve the transhuman Dave Bowman, the now fully self-aware HAL, and an ancient alien race of unfathomable power. Book 3 of the Space Odyssey series.